Though you may be seeing us for pain in a particular area we look at the whole body because it could be an adaptation of something else that’s causing the pain. That’s why we take a whole body approach. We start from your feet and work all the way up to the top of your head. It’s our goal to get areas of your body to move properly. While the joints in your spine are important because they have nerves beside them, your hips, knees and ankles are also critical. They need to be moving accordingly as well allowing the whole body to heal properly. An adjustment takes stress off the nerve, so the body works more correctly from within. Chiropractic allows the body to work at a more optimal level. Dr. Ron doesn’t just use one specific technique. Because we use a whole body approach, he will use whatever techniques are necessary to get you well because you’re different from everyone else. Patients who first come in usually see us for pain relief. Once they’re out of pain, they go to corrective care and then maintenance care. Chiropractic is about promoting health, not just suppressing a symptom. Just like going to the gym or doing yoga several days a week can help you feel great, chiropractic is another healthy avenue to take on your journey to wellness. Patients will often feel a lot better after the first adjustment. If we can get your body to work at its best, chances are you’re going to do better, and you won’t be in as much discomfort. Because your feet are your foundation, orthotics is important. 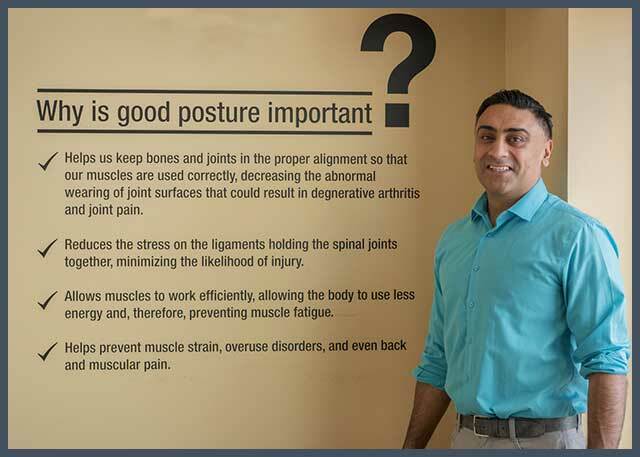 Posture is also crucial because if you have great posture, your spine will be in a better position to absorb stress. Chiropractic is one of the avenues to get you through all those stresses. It’s about pain relief for some people and also about optimal well-being. To help keep you healthy when you’re not here, Dr. Ron will give you stretches and exercises to do at home. He’ll help you get posturally sound and moving correctly so you and your body can do what you need to perform. Find out how our whole body approach to health can help you to feel fantastic!